Dempsey & Carroll has been one of the finest purveyors of elegant engraved social stationery since 1878. The founders viewed the social institutions of correspondence and etiquette as completely inseparable and Dempsey & Carroll has been the ideal marriage of the two ever since. Check out their new website at dempseyandcarroll.com. This project called for a complete rebuild of the Dempsey & Carroll online store onto Magento v1.14. 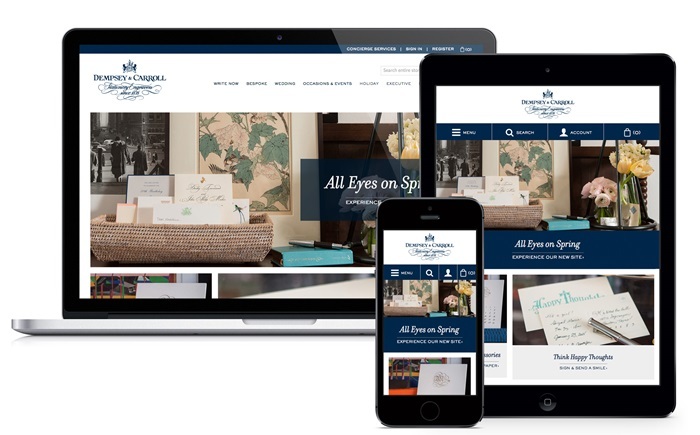 The latest features coupled with a modern and elegant look and feel have created a superior online user-experience for Dempsey & Carroll’s clients and staff. Its new responsive design also makes the site much easier to navigate and browse across all devices. A major achievement of the initiative with the new site was our ability to help Dempsey & Carroll streamline their business processes across all distribution channels. Congrats to all who pitched in to make this a successful launch!